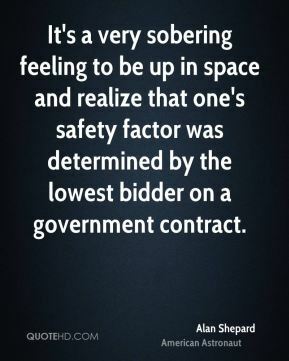 It's a very sobering feeling to be up in space and realize that one's safety factor was determined by the lowest bidder on a government contract. 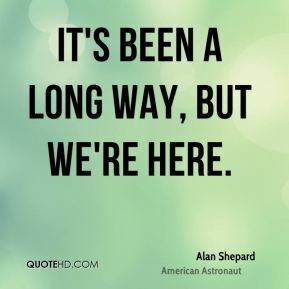 It's been a long way, but we're here. 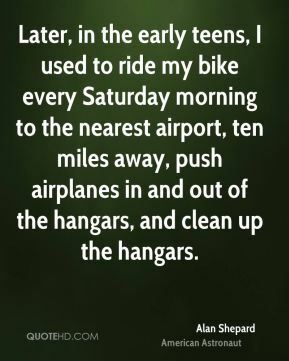 Later, in the early teens, I used to ride my bike every Saturday morning to the nearest airport, ten miles away, push airplanes in and out of the hangars, and clean up the hangars. 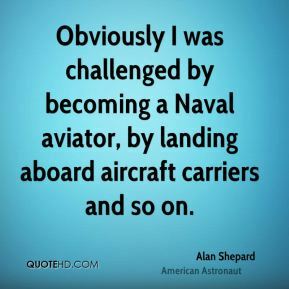 Obviously I was challenged by becoming a Naval aviator, by landing aboard aircraft carriers and so on. Of course I was delighted the flight was over, but I still had to worry about cleaning up inside the cabin, I had to worry about the hatch, how to get in the sling, and so on. 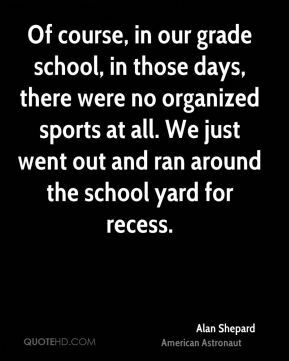 Of course, in our grade school, in those days, there were no organized sports at all. We just went out and ran around the school yard for recess. 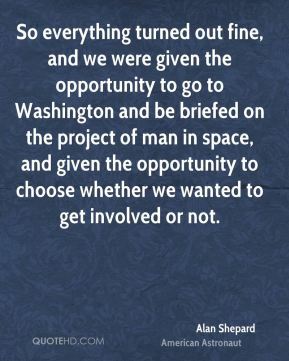 So everything turned out fine, and we were given the opportunity to go to Washington and be briefed on the project of man in space, and given the opportunity to choose whether we wanted to get involved or not. 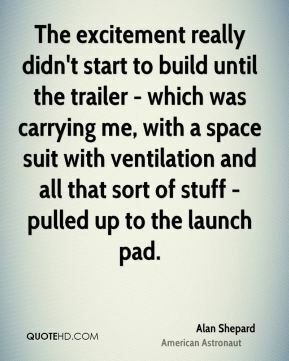 The excitement really didn't start to build until the trailer - which was carrying me, with a space suit with ventilation and all that sort of stuff - pulled up to the launch pad. 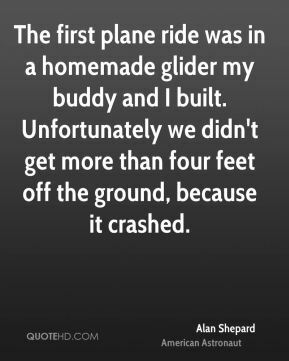 The first plane ride was in a homemade glider my buddy and I built. Unfortunately we didn't get more than four feet off the ground, because it crashed. 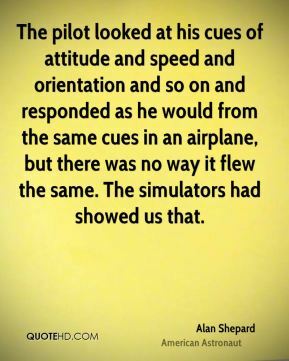 The pilot looked at his cues of attitude and speed and orientation and so on and responded as he would from the same cues in an airplane, but there was no way it flew the same. The simulators had showed us that. 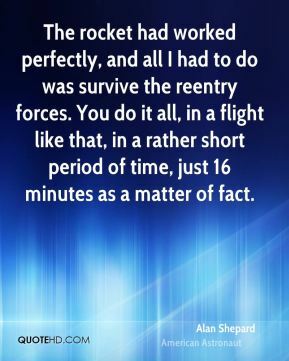 The rocket had worked perfectly, and all I had to do was survive the reentry forces. You do it all, in a flight like that, in a rather short period of time, just 16 minutes as a matter of fact. 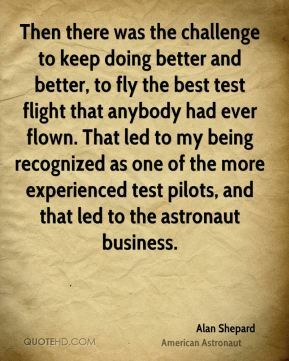 Then there was the challenge to keep doing better and better, to fly the best test flight that anybody had ever flown. That led to my being recognized as one of the more experienced test pilots, and that led to the astronaut business. 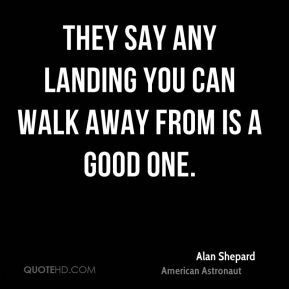 They say any landing you can walk away from is a good one. 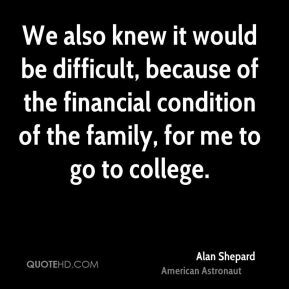 We also knew it would be difficult, because of the financial condition of the family, for me to go to college. 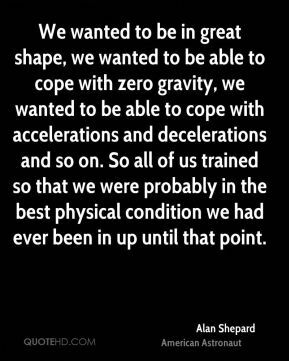 We wanted to be in great shape, we wanted to be able to cope with zero gravity, we wanted to be able to cope with accelerations and decelerations and so on. So all of us trained so that we were probably in the best physical condition we had ever been in up until that point. 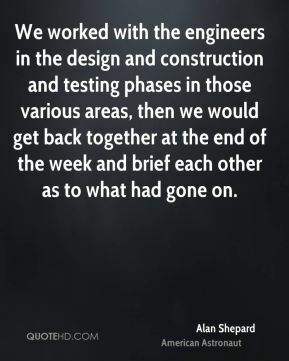 We worked with the engineers in the design and construction and testing phases in those various areas, then we would get back together at the end of the week and brief each other as to what had gone on. 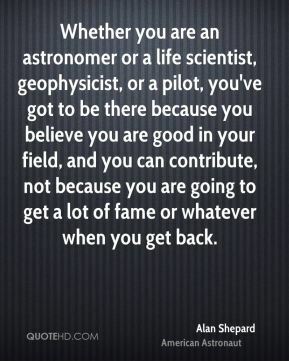 Whether you are an astronomer or a life scientist, geophysicist, or a pilot, you've got to be there because you believe you are good in your field, and you can contribute, not because you are going to get a lot of fame or whatever when you get back. 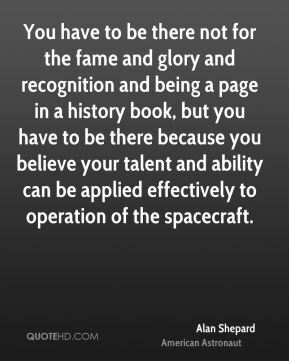 You have to be there not for the fame and glory and recognition and being a page in a history book, but you have to be there because you believe your talent and ability can be applied effectively to operation of the spacecraft. 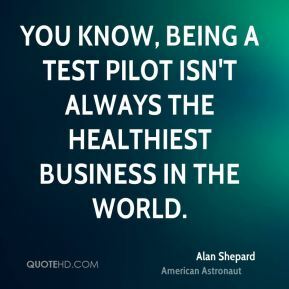 You know, being a test pilot isn't always the healthiest business in the world. 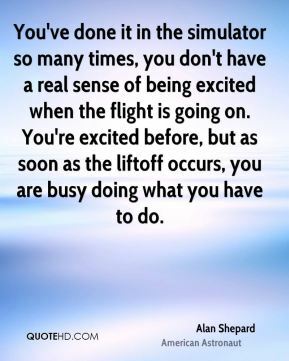 You've done it in the simulator so many times, you don't have a real sense of being excited when the flight is going on. You're excited before, but as soon as the liftoff occurs, you are busy doing what you have to do. 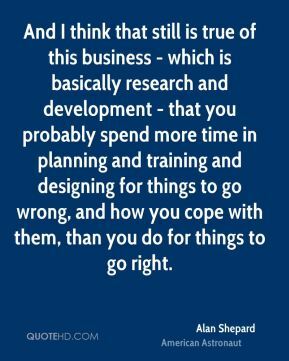 And I think that still is true of this business - which is basically research and development - that you probably spend more time in planning and training and designing for things to go wrong, and how you cope with them, than you do for things to go right. 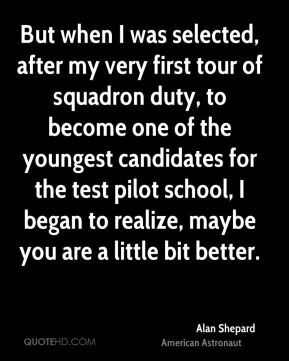 But when I was selected, after my very first tour of squadron duty, to become one of the youngest candidates for the test pilot school, I began to realize, maybe you are a little bit better. I didn't mind studying. 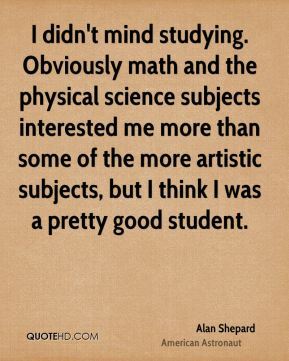 Obviously math and the physical science subjects interested me more than some of the more artistic subjects, but I think I was a pretty good student. 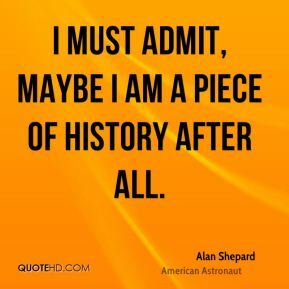 I must admit, maybe I am a piece of history after all. 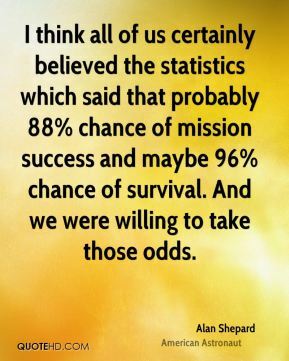 I think all of us certainly believed the statistics which said that probably 88% chance of mission success and maybe 96% chance of survival. And we were willing to take those odds.